BoingBoing blogged about reproducing keys from distant photographs. This made me think back off what we were doing at Hacking At Random ’09 with our RepRaps. 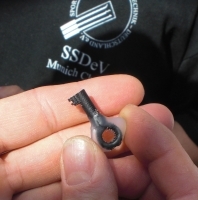 Ray had created an STL model (3D design file) of a police handcuff key. He had also made it based on a photo. He printed it back in Germany, where it worked in a set of handcuffs that he owned. 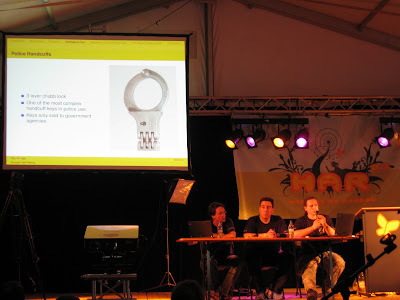 On my RepRap we printed another couple of keys during the event. It’s a tiny fiddly key, so its strength varied from print to print and needed some more tweaking, but it actually worked. During HAR they asked policemen to give it a try. Most refused, but then one of them tried it and it worked. And Ray told me that it was one of the locks that you won’t open with a paper clip (too bad, because I also printed those). Still, I will try not to give the police a reason to get caught. I don’t think that I am heroic/stupid enough to use it to escape from the police, though. Similarly, some people had printed out some HAR 10 euro coins. inflation through technology from Leiwandville on Vimeo. It wasn’t used for real, but it did work. If someone would use it, the people at HAR would find out afterwards. They would know it came from someone with a 3D printer. Each home-built 3D printer has its own ‘signature’, so they could end up with me. Then again, the real reason I won’t print coins for profit is that I don’t want to ruin an event that I care about. The fact that you CAN do bad things with a technology is nothing new. It’s the same with the internet in general, where people can exchange ideas about bad things just as easily as good things. Now with 3D printing this capability is extended to the physical realm, you can also exchange ‘bad’ or ‘good’ things yourself. As far as the use that is beneficial to society far outstrips the detrimental use, we can be glad about this. I’m confident that this is the case, and that good ideas will propagate faster, simply because more people have the incentive to spread and use them. Having the knowledge or capabilities to do bad things should never be illegal per se. Doing bad things (like escaping from custody or creating counterfeit money) should be, however.